Once you’ve decided to turn your musical hobby into a business there will be statistical information that you will need to keep track of. This data is referred to as the metrics of your business and marketing efforts. Things like: how many Facebook fans you have, how many digital downloads you’ve sold, how many people opened your last email, etc. 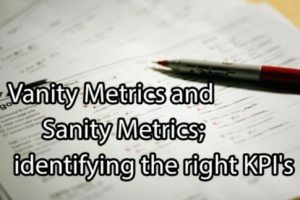 In fact, there are so many bits of data that one could measure that it becomes important to determine which are the “key performance indicators” (KPI’s) of you business and which are simply “vanity metrics”.